New York is filled with fantastic nightlife, but we’re all guilty of finding our favorite restaurant, bar, or club and sticking to it. Many people don’t branch out because they lack the incentive to do so, but this hospitality app is completely changing that. HOOCH is a subscription hospitality app that gives members free perks at more than 100,000 top hotels, restaurants, and bars all over the world – including its beloved perk of “One Free Drink Every Day” at top-notch cocktail bars. 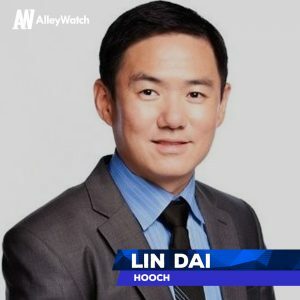 AlleyWatch spoke with CEO and Cofounder Lin Dai to learn about how they are facilitating the creation of the “experience” economy and the company’s latest round of funding, which brings the total funding raised to $7.8M for the startup founded in 2014. We just closed our $5M Seed round of financing co-led by Revelis Capital Group, and Blue Scorpion Investments, and completed by additional institutional and strategic investors including Access Industries Holdings, Warner Music Group, FJ Labs, Diesel CEO Stefano Rosso, Comcast ex-CTO Sree Kotay, and several other top investors. HOOCH is the first-ever subscription hospitality app, where members receive perks at over 100,000+ top hotels, restaurants, and bars around the world, from One Free Drink Every Day at premium cocktail bars from New York to Hong Kong, to 20-60% off Expedia rates on top hotels in almost every major city around the world. HOOCH offers two tiers of membership: HOOCH Verified and the brand new, HOOCH BLACK. HOOCH gives members a free drink every day at top cocktail bars, elite lounges and premiere restaurants for $9.99 per month. HOOCH BLACK launched in late April 2018, as HOOCH’s elevated membership and concierge service for Millennials and young professionals offering exclusive travel, dining and other experiential perks. For an annual fee of $295 (less than $25 a month annualized), HOOCH BLACK members enjoy VIP travel perks (savings of up to 60% relative to Expedia or Travelocity at over 100,000 hotels worldwide), high-end dining and cocktail experiences–preferred reservations, reduced tabs and free rounds of champagne, and access to once-in-a-lifetime, celebrity-hosted experiences–think snowboarding lessons with an Olympic gold-medalist, dinner with a Grammy winner, and more. What inspired you to start HOOCH? After my last company was taken public on the Toronto Stock Exchange, I wanted to take my learning and experience as CMO of a 75M user app and start a new project. I returned to New York and ran into some old friends, who became my two current cofounders. They were already prototyping a “Universal Drink Ticket” App that I thought was interesting. My cofounder Aleksey came up with the idea to build an app that rewards customers with kind of a digital “drink ticket”, except it could be used at more than one venue. After all, it’s all about driving you to the venue, because when was the last time you went to a bar and ONLY had just one drink? Jared our other cofounder happens to be an expert in performance marketing and user acquisition. Jared founded and ran a top agency and acquired all the early users for Living Social, Casper, and more. We ran test campaigns and saw huge potential. Taking a page out of another successful subscription app “ClassPass”, we created the first ever subscription drink app. What quickly got my attention was that our active users were in fact 21-35 year old, young professionals, with an average household income of $150,000 or more. It’s not college kids that can’t afford to buy their drinks. A light bulb went off in my head, people “like” a free drink, but they crave the “experience” of discovery. Millennials care about experiences more than anything, so we started working on building an “experience” app that caters to everything Millennials would want in the experience category – drinks, dining, travel, celebrity events, concerts, and many more, which we are excited to finally launch as a full hospitality discovery platform we call HOOCH BLACK. Many of the top apps today are built around convenience. They facilitate a “couch economy” – you sit on your couch and order everything from take-out to alcohol delivery or swipe your screen for dates. Millennials are connecting less and less in person. We crave that in-person touch and connection, after all humans are social animals. Hooch App is the antidote to the “couch economy”;99% of the experiences inside the app, from free cocktails to deals on top hotels, are all about getting you back into the real world, drink, eat, travel a little, and most importantly, connect. The big difference between HOOCH and traditional concierge programs such as Amex Platinum or Visa Invite is that everything is built into our app. Rather than calling someone on the phone to book a hotel or dining reservation–which is a terrible experience for Millennials who grew up on Apps and Snapchat–a member can book at up to 60% off published rates at 100,000+ hotels via our private search engine or chat in-app with real people from our concierge team to book a dinner reservation. Our dining perks often include free rounds of champagne or cocktails and up to 20% off your entire bill at top places such as Tao or STK–deals that are pretty rare for even Amex or Visa concierge. What market is HOOCH targeting and how big is it? Hooch App is for young professionals between 21 to 35 years old, evenly split between male and female. Our newest HOOCH BLACK members share some common trait such as “aspiration”, what I call “Millennial Hustlers”. We have a 24-hour application process to become a Hooch Black member, but it’s not there to keep people away based on job title or age or salary, it’s meant to learn about where you want to go and who you aspire to be. We want to hear about your goals and passions. You could be a copywriter now but maybe you aspire to be the next Anna Wintour – we want members who dream hard and hustle harder. HOOCH members pay $9.99/month – or less than the price of a single drink – for up to 31 cocktails at hundreds of top bars and restaurants. HOOCH BLACK members pay $295/year (less than $25 a month annualized) for everything under the regular membership, plus exclusive access to travel, dining, event and concierge perks. Our next generation product will be built with blockchain technology, enabling you to earn rewards for redeeming at any of our network of 100,000+ top hotels, restaurants, and bars. As a rule of thumb, budget twice as much time as you think you’ll need for the raise. Funding is similar to dating in that you’re looking for an ideal long-term partner in most cases. Those partners aren’t easy to find and even when you find them they need to be at the right time to make a match. In HOOCH’s case, we specifically looked for strategic investors to lead the round. 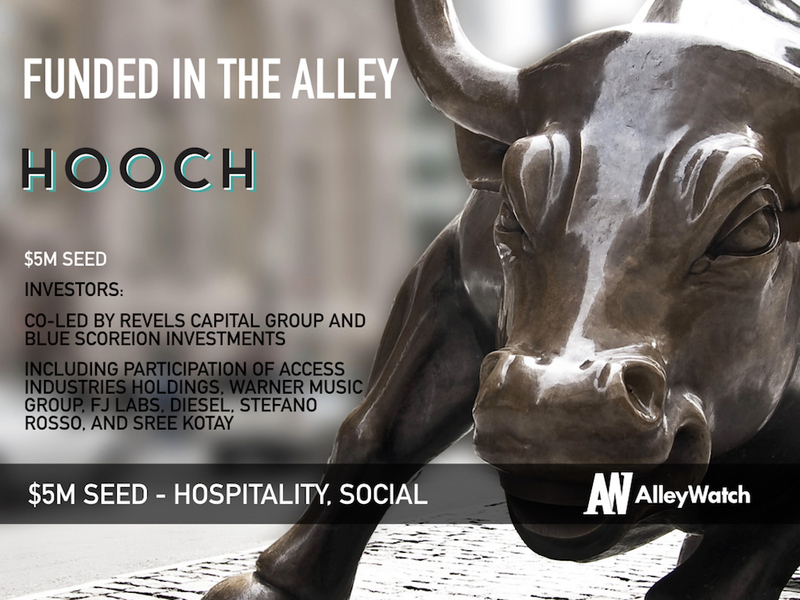 Revelis Capital Group is deeply connected to the hotel industry, which makes perfect sense for Hooch as we expand our offerings to top hotels worldwide. Our previous round lead investor, Blue Scorpion Investments also co-lead this round, and put us in touch with great investors such as Rosario Dawson, Diesel CEO Stefano Rosso, Warner Music Group CEO Steve Cooper and many more. These are literally the top people in their respective fields in the world. I learned so much from my meetings with Steve on running businesses in general, and we really saw eye-to-eye on the potential of strategic partnership and collaborations between Hooch and WMG. We are grateful and thrilled for all our strategic investor’s support beyond just writing a check. It shows up in our growth and most importantly it shows up in our investor culture and community. We all do more than asked of us. 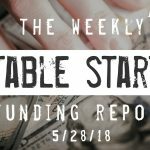 We’ve had a number of opportunities to receive funding from well-known partners (including a shark or two) that did not feel right, so we’ve declined. Once you get the business model down and you have the right team behind that model, your opportunities can become near limitless. 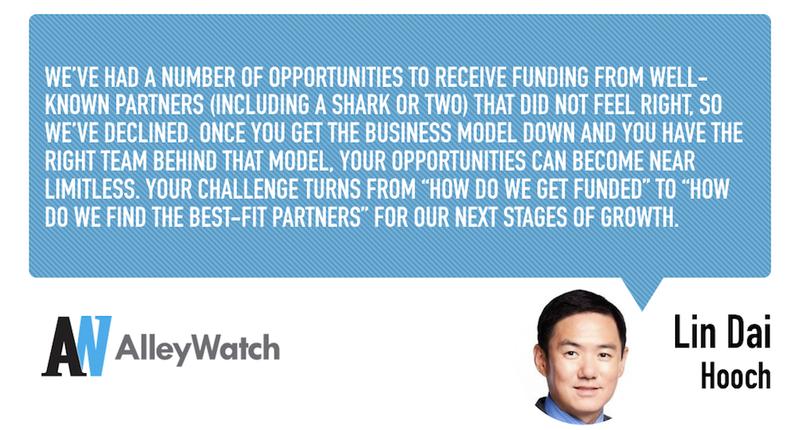 Your challenge turns from “how do we get funded” to “how do we find the best-fit partners” for our next stages of growth. It is maintaining that discipline that can be the toughest part and a number of top startup CEOs I know echo that sentiment. When you have a guiding light that directs what you’re doing and with whom, you can narrow the uncertainty that you end up with a less-than-ideal partner or otherwise go off track. I think what most investors like about us is the team we have assembled. Between me and my cofounder Jared, I’ve taken two other companies public, and Jared has built his agency from his dorm room to over $80M revenue a year. But we are never too proud to ask for advice. The new advisory board we assembled include Bob Hurst, ex-Vice Chairman of Goldman Sachs, Sree Kotay, most recently CTO of Comcast, Bonin Bough, ex-CMO of Mondelez (Kraft) and host of CNBC’s Cleveland Hustles, and Teymour Farman-Farmaian, Managing Director of Xapo, the largest custodian of Bitcoin in the world, and ex-CMO/CRO of Spotify. We have a strong team that is well-versed in the tech and hospitality space and we play off of each others strengths to grow every day. PHD at Dream Midtown. Incredible cocktails, food and atmosphere paired with sweeping skyline views. And of course Hotel Chantelle, where HOOCH started when my cofounder Aleksey first came up with the original idea.